Getting to the Florida Keys is one of the great journeys that you can take. Forget about the Orient Express, the Trans-Siberian railway and route 66, once you hit the beginning of US1 aka the overseas highway then you are in for a treat. Make no mistake...I get a buzz every time the road stretching across the water comes into view. It really is one of the wonders of the modern world, and what makes it so amazing is the story of how it came about due mainly to the dream of one man....Henry Flagler self-made man and saviour of the Florida Keys. But that is not what you are here for you...I know so lets look at all the other travel options that might interest in you if of course, you decide that you fancied skipping the drive and getting to the Florida Keys in the quickest or most luxurious way imaginable. Well we have all the information that you will need to make the most of your vacation, so scroll down and make your choice and whatever method of transport that you decide on you won't be disappointed. Right at the very beginning of the Keys, at Key Largo is where your adventure will start. This is where the Overseas Highway meets the mainland of Florida and then winds its way dramatically across the deep blue expanse of water for 97.6 miles until you can't go any further and you are in Key West. And just a little word of advice about this bustling and slightly crazy Key West. It is one of the hardest places if not THE hardest place to park your car in the Florida Keys. So make sure you check out our detailed page on Key West Parking, so you won't start your vacation wishing you had gone somewhere else instead. But getting back to the actual driving, the whole trip if you were planning of doing it all in one go should take you about 2 hours and 4 minutes. But one thing for sure is you would be missing out on a hell of a lot of great places to visit, or just experience. You know the kind of places where there isn't much there, but really gives you a taste of the real stuff...the Florida Keys that people do not talk about on the travel advisor sites. If you fancy the "Slow" version of getting to the Florida Keys then we can show you that too. We have a great Pre-planned Road Trip that will take you a few days, but highlights not only the classic tourist stuff, but also the "Off the beaten Track" stuff, that you will come to love. So use the Road Trip instructions that you'll find on our Florida Keys Driving page and have the drive of a lifetime. Or on the other hand have you thought about a bus? Travelling on a bus anywhere, not just to the Florida Keys and back is for many people not one that they have on their "to do" list. In fact for many people it is something that can send shivers down their spines. But it shouldn't have to be like that if you know what you are doing, and to be honest a bus can be like a little community of strangers, that become temporary friends whilst America passes by outside your windows. Added to the fact that with a simple click you can find timetables and pricing for all bus services to and from the Florida Keys, just sit in your armchair with a nice drink and let us do all the work for you. Now that doesn't sound too bad now does it? Check any of the images above for the best in getting to and around the Keys by road. When it comes to travelling to the Florida Keys you have a wealth of choices dependent on your urgency and your bank balance. You see most flights that come straight into the Florida Keys airports themselves are of the private charter variety. So imagine that you want flights straight into Key West from New York for some quick winter sunshine. Then unless you have the bank balance that most of us die for you, you will need to make a stop at probably Miami Airport or Fort Worth. So take a look at our detailed information on the airlines and airports that are proud to provide a service straight to Key West to the tourists and residents of the Florida Keys and book your ticket as soon as possible. Drop us a line and tell us how great your trip was! Although you may have heard all about Henry Flagler and his railroad and thought "That will do me....jump on a train and the next stop will be the Florida Keys"
I have to tell you, that unfortunately it wont be as easy as that. The Florida Keys have no train service running since 1935, when the last train left Key West and got hit by the big Labor Day hurricane. So that was that, and although Amtrak are probably the best and most well known of the train operators running across the whole of America, they will only take you as far as Fort Lauderdale. But then it is a simple case of either hiring a car or jumping on one of the many bus services mentioned above. So you do have options, but unfortunately door to door train service at this moment of time is not one to help you getting to the Florida Keys as quickly as possible. The last way really other than walking of getting to the Florida Keys is by going the romantic way....by sea. Key West has a really good ferry service that departs daily from either Marco Island or Ft Myers and really in comparison to driving is quick. The journey from Fort Myers down to Key West is only 3 and a half hours, and when you compare that to 2 and a half whilst driving in the hope that you don't hit traffic its not much different. But one thing different is the luxury aboard the ferry which has a full bar, tv's and even bicycles available . So you can sit in the sunshine, sipping on a cool drink as the waters of the Florida Keys pass you by. And that my friend is about as good a start to your vacation as you can hope for. 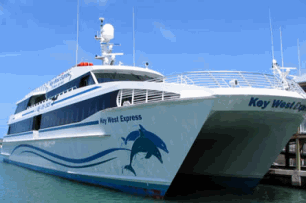 So click on the following link to take you straight to the website of the Key West Ferry, and have a great time with the knowledgeable and courteous crew on-board.